Top quality Savage without blowing your budget! In case you're wondering how Savage can make a rifle in the USA and still save you money WITHOUT sacrificing performance, here's the secret: they didn't design a cheaper rifle. They designed a better way to make a Savage! With sleek modern looks and a silky-smooth bolt, the Axis is among finest budget rifles we offer. Better yet, it's ready to go with factory-installed and boresighted 3-9x40mm Scope! 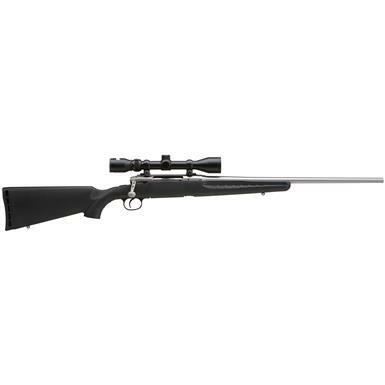 Mossberg Patriot Combo, Bolt Action, .243 Winchester, 22"
Mossberg Patriot Combo, Bolt Action, .270 Winchester, 22"
No one does budget excellence like Mossberg. Dollar-for-dollar, it doesn't get much better than this.